For over four decades the remarkable Flora Molton has served her Nation's Capital as both musician and composer. With her slide guitar and gospel repertoire she has continued a tradition of sidewalk serenading, or busking, if you like, which extends back to the dawn of urban civilization. 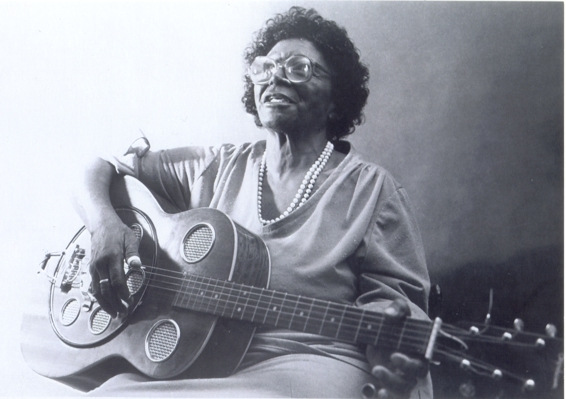 As a child growing up in rural Louisa County, Virginia, she was exposed to the reels and set dance tunes of her elders as well as the newer blues of Bessie Smith, Blind Lemon Jefferson, and Sara Martin (her favorite) from phonograph records. Some of the earliest tunes she remembers are a version of "Wasn't it Sad When That Great Ship Went Down," learned on a neighbor's accordion, W.C. Handy's early "Hesitation Blues," and a dimly remembered "Atlanta Blues," learned on a parlor organ. Ms. Molton's father was a Baptist minister who supported his family by farming, an activity which experienced a depression several years before Wall Street crashed in '29. To supplement his income, he began spending his winters mining coal, moving to the company town of New Hall, West Virginia during the winters, where his family eventually joined him. A brother eventually adopted his father's profession, taking young Flora to Berryville, Virginia in the mid -thirties and to Washington in 1937, when he became minister of the Florida Avenue Baptist Church. It was here that a man showed her how to tune her guitar in Vastopol (open D) and her own musicianship took care of the rest. This album represents the several sides of Ms. Molton's musical life - her street ministry, her work with church groups, and her concert and festival performances, which include the Smithsonian Festival of American Folklife, the Library of Congress, numerous clubs, and a fondly remembered private concert for the Rolling Stones. The songs are her own compositions, or traditional gospel songs enhanced by new Molton arrangements. If you've never met this warm, engaging lady, this record will serve as introduction. If you have, then it will be a welcome souvenir. 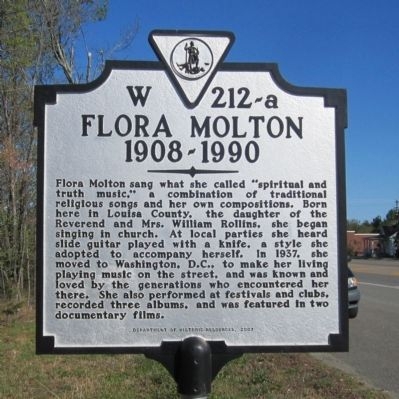 Either way, it's top drawer old-time black gospel music, as only Flora Molton knows how to perform it. 1. SWING LOW SWEET CHARIOT: I heard that when I was a little girl, 6 or 7 years old, that old one they sing. They used to say you were going to rise in the chariot to heaven. Then, in the later days, they changed it and put a little rhythm to it. So I sing it the old way first, to remember how we used to sing it, and then I change it to the rhythm to remember now, because we're living in different times. 2. I CAN'T STAND IT: I wrote that on myself. 3. NEVER DRIVE A STRANGER FROM YOUR DOOR: Never drive a stranger from your door, because you don't know who you turn away. You could be turning away Jesus. That's a true song. When the Lord calls me, that's one song I want to sing at my own funeral. 5. ALL AROUND ME SHINE: Rather than riches or gold, I'd rather have Jesus. 6. TELL ME HOW LONG HAS THE TRAIN BEEN GONE: My father used to sing that when he was running revivals. But he didn't have those words I have. So I rearranged it. 7. IN THE LITTLE COUNTRY TOWN WHERE I WAS BORN: That was true. That was my home in Virginia, when I was first converted. I was seven years old and my mother thought I was too young. That's why my advice to people is to pay attention to children regardless of the age. When they tell you something you watch and listen and don't turn them away. Listen to everything they say, because some things make sense. Mothers should pay more attention to children. 8. SUN GOING TO SHINE IN VIETNAM SOME DAY: They were fighting in Vietnam when I wrote that song. I wrote it because I felt like one day they were going to stop fighting. I felt sorry for the boys, some came back crippled, some didn't come back at all. And I felt sorry for the poor mothers. In the spiritual side, it was cloudy. But when they stop fighting, then the sun shines. And I felt like the sun would shine in Vietnam one day. And it did happen. 9. REJECTED STONE: That was written on me. When I first was out playing onthe streets, I was rejected many times. And I styled myself then as a rejected stone. Because Jesus styled himself as a rejected stone. When He came down He was rejected. I don't feel rejected any more.